When we made the booking, we were told that we could definitely have a 6pm table, but we may have to leave before 8, due to lots of bookings for the tennis. As we were prepared for this, and the food came out speedily, this was definitely not a problem. In fact, I think it was very considerate of them to tell us when we booked! Lovely drink. Plus you can see me tweeting in the background. 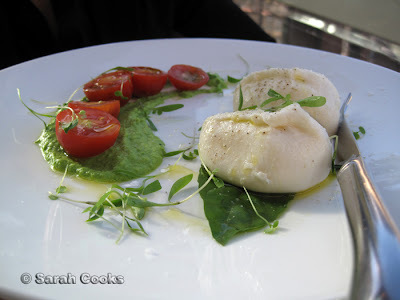 For starters, we shared the mozzarella special - burrata with fresh pea puree and cherry tomatoes. The little leaves you see scattered on the plate tasted like very fresh coriander, but I'm not sure what they actually were. Love the pea puree swirl - they've certainly got a bit more cheffy since the last time I visited! 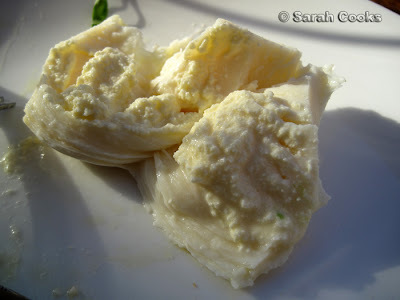 I'd never had burrata before, but was very keen to try it. The outside is normal mozzarella, whereas the inside is a mixture of mozzarella and cream, giving it a very soft, almost liquid centre. It was absolutely delicious, intensely milky and soft. It was fabulous with the herbs, peas, tomatoes and bread. And a generous sprinkling of salt! 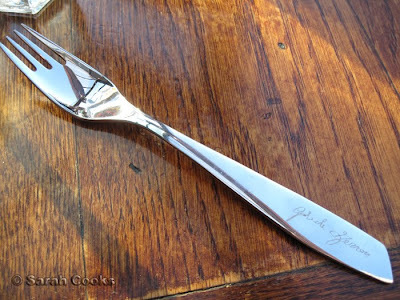 But first, let's check out this funky risotto spoon! 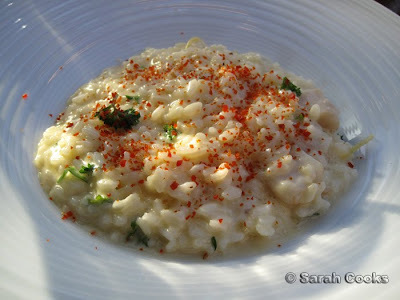 For myself, I ordered a new addition to the menu - risotto with prosecco and scallops. (If you can't tell, I'm a sucker for any type of sparkling wine. Although it looked great and had perfect texture, I was slightly disappointed with this one, as it was a little bland for my taste. 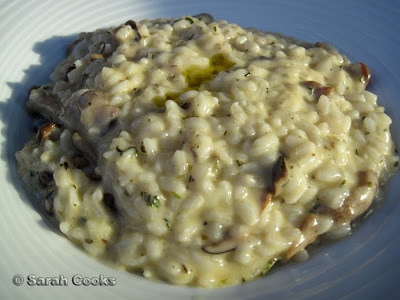 I was suffering some serious plate-envy when I saw Sandra's mushroom risotto! Classic. I love how there's such a huge variety of different mushrooms in there. After all of that deliciousness, there was still heaps of time, but alas, no room for dessert, so all that was left was a leisurely walk up to the cinema! Check out this beautiful pavlova that my niece made! I love how the strawberries are piled up majestically on top. What a great way to spend Australia day. As I'm sure almost all of the country did, we had a BBQ today to celebrate. 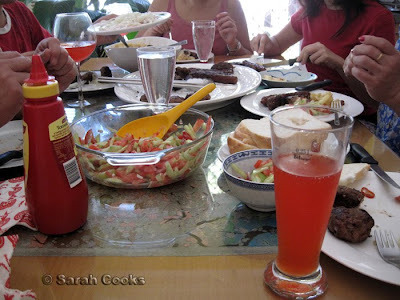 We kept it very simple, with 3 meats - Frikadellen, cevapcici and sausages. 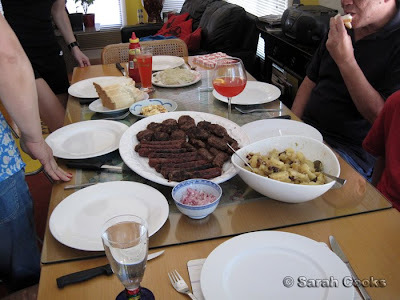 Cevapcici are Eastern European skinless sausages, which we made in a similar manner to the Frikadellen, but with lots of spices and no bread inside. 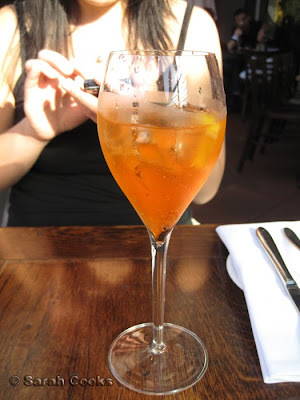 The drink in the wine glass is a campari spritz, my version of Tutto Bene's aperol spritz. It's just campari and sparkling wine with a slice of orange. It's so refreshing! My drink of the summer. I also made a kid-friendly version for my nephew Darren, by pouring blood orange soft drink into a big wine glass with a slice of orange. We also made a block of grilled feta, a big plate of grilled onions, some German potato salad, and a very light cucumber and tomato salad. 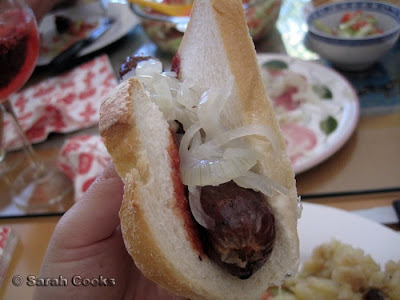 White bread, onions, sausage and tomato sauce. How Austraay-yan can you get? And then it was time for dessert. 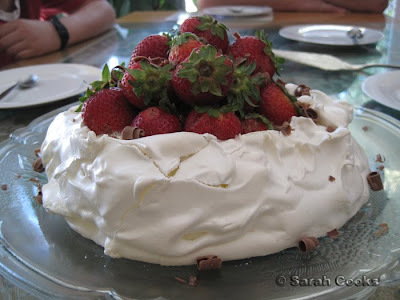 Cheryl's pavlova was perfect, with a great balance between bland cream, sweet fluffy centre and crispy shell. 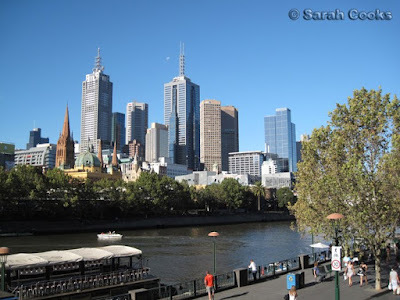 Pretty much every time I go out to eat, the little Canon IXUS is whipped out and photos are duly taken. Whether or not these pictures actually make it to the blog is another matter entirely... (I know, bad blogger!!) With that in mind, I would like to share with you some different foodie-ventures from the end of last year. We visited here a few months back, when I was on the prowl for an excellent coffee. As the name suggests, they do roast their own coffee. My cappuccino (below), didn't quite live up to expectations. It was a bit weak, and on the cold side. And yes, I realise coffees aren't supposed to be blindingly hot, but I found it still too cold - as if it had been sitting on the bench just a touch too long before being brought over. A few weeks later at the Beast on a Block event, I happened to mention this to Ed, who suggested that they may have still been getting their coffee balance right, as they were still new when I visited. They had a great range of panini and baguettes though, with delicious fillings, and Andrew's bacon and ham. Mmm.. a whole fridge full of Andrew's ham, bacon and sausages. I so want that fridge! I don't think you can go wrong with a combo like that. I loved the little bowl of olives too! This baguette, however, was the star of the show. The baguette didn't look too impressive at first - the bread was what I would describe as "Asian bakery style", i.e. super soft and white - but the whole thing worked so well! The pancetta was incredibly crispy, with creamy scrambled eggs and a generous portion of lemony hollandaise. Wow! I am embarrassed to say I don't remember what this dish is called, or what country it comes from. As I was walking down Johnston street I saw massive trays of suckling pig and could not think any further. If anyone can help me out with a name, (and a recipe!) I would be most appreciative! As you can kinda see in the photo, the dish consists of a massive tray, with burnished crackling wrapped around a filling of rice and tender pork pieces. It was a bit expensive at $14 a portion (what is with festival prices?! ), but I couldn't resist. With each portion came a nice big piece of crackling - which, unfortunately, was too hard to bite - and a funky white round doughy thing (again, apologies for my food amnesia!). The star of the show was the salty rice and pork mixture. The rice was a bit soft and sticky (yum yum), with big chunks of meltingly soft pork all the way through. From memory the lasagne was about $14? It came with a generous heaping of tomato sauce on the side, which was nice, but made the overall lasagne a bit too sour for me. I am *all* about the creamy bechamel. The lasagne wasn't hot all the way through, so I asked them to heat it up a bit more. It wasn't thoroughly cold on the inside, just warmish. It wasn't a huge deal for me - I also make lasagne myself, and I know it's hard reheat slices properly without the edges curling and going feral. Anyway, the dude who worked there was very nice and apologetic, reheated it straight away and put some extra sauce on it to make it look pretty again. This time it was piping hot. In fact, it was thermonuclear. He also offered me a free pastry to make up for it! I chose a fresh cream eclair. Emphasis on the word "fresh" - both cream and choux were very fresh and delicious. Hmm... maybe I should have just ordered 3 of them for lunch, hehehe. I popped in a few weeks before Christmas for a quick pre-work brunch. One of the benefits of doing a late shift! I was surprised *not* to run into Adrian here, haha. (I previously visited 401, and blogged about it here). This is where I fell in love with these cups! Dad bought them for me for Christmas, yay! (They can be ordered from this website). I had a rather lovely croque-monsieur with Kurobuta ham - very well priced at $6.50. It looked as though it might be dry, but in fact it had a great balance of white bread, ham, cheese and just-the-right amount of sauce in between. Here's to a year full of exciting foodie-ventures! Or rissoles filled with feta, mashed potatoes, peas and carrots. Somehow it sounds a lot more inviting in German! Even though it's the closest translation, I am actually loath to refer to these delicious meat-and-feta-patties-of-deliciousness as "rissoles". 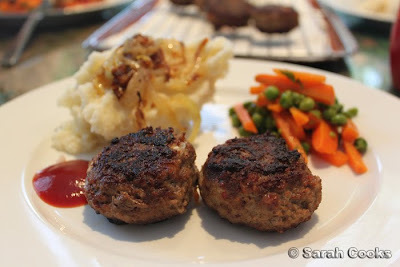 The word "rissole" always makes me think of those burnt and tasteless balls of meat that we would eat on school camp. Despite being an Aussie staple, rissoles were never something I ate at home - I think it's more an Anglo-Aussie food? The similar-yet-different Frikadellen are a staple of German home cooking (Heidi Klum even made them on the Ellen show once! ), and never having eaten them before, I thought that they would taste, well, like rissoles. When Sandra suggested we make Frikadellen for our post-Christmas BBQ spectacular, I can't say I was too keen. However, we did have a good deal of mince in the freezer, and I wasn't up for making anything else from scratch, so I gave them a go. I followed the recipe for Frikadellen mit Schafskäsefüllung in my new Dr. Oetker Schul Koch Buch. This book (which I got for Christmas), is seriously awesome. It's like a German version of Cookery the Australian Way, with heaps of basic recipes. 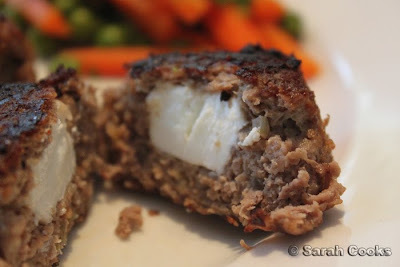 You may remember we made them with lamb mince and stuffed them with cubes of feta, and oh my GOD they were good!!! 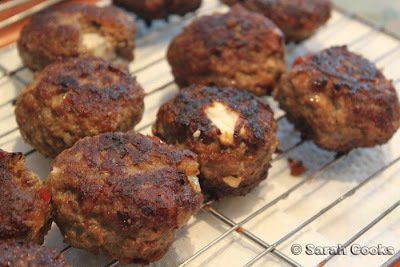 They were juicy and tasty and crunchy - way better than rissoles or normal burgers. 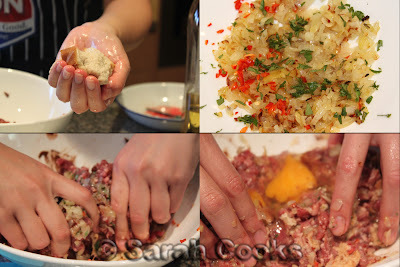 The recipe includes a bread roll, which you soak in cold water before adding to the mince. This makes the finished Frikadellen juicy and bouncy. After the BBQ I was totally craving them all week. I made them again for dinner a few days later, this time served with carrots, peas, mashed potato, and sauteéd onions. 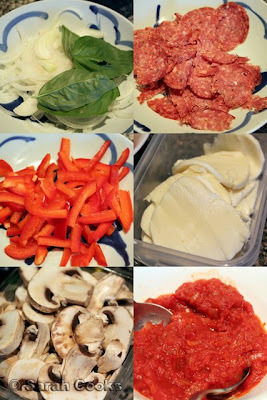 The recipe for the Frikadellen is posted below (with step-by-step pictures - get excited people). 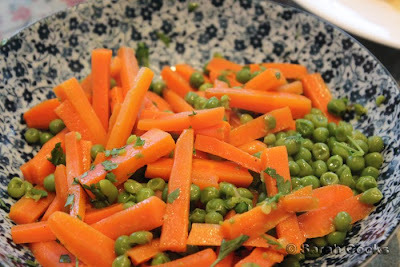 The onions were simply sliced and cooked slowly in butter until soft and melty, and the carrots and peas were cooked according to a basic recipe in the book. You sauteé the peas and chopped carrots in a little butter, add a splash of vegetable stock, cover and cook for 5 minutes. To serve, you sprinkle with some parsley, salt and pepper. Ta-dah! It was such a delicious dinner, and I can see myself making Frikadellen again and again. Soak the bread roll in cold water. Peel the onions and finely chop. Finely chop the chilli. Heat 2 tbs oil in a pan, add the onions and chilli and cook for 2-3 minutes until soft and translucent. Set aside in a bowl and leave to cool. 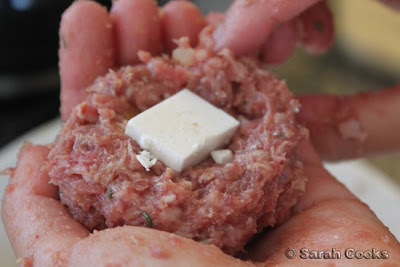 Form the meat into patties, and stuff each patty with one cube of feta. Try and make sure that the feta is completely enclosed by the meat. Place the raw Frikadellen in the fridge for 30 minutes or so to firm up. 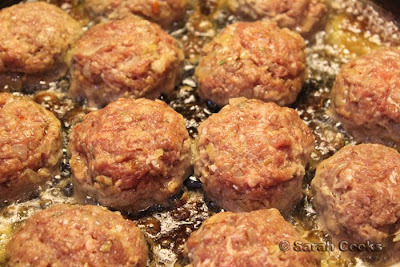 Fry the balls in hot oil for about 4 minutes a side, or until cooked. While you are frying the remainder of the mixture, leave any cooked Frikadellen on a rack over paper towels. This will stop them going soggy! Pizza is fun to make! I love making yeasty doughs, and you also get to choose any flavour combo you like. It's hard to get them just as crispy as the professionals do, but if you've got an oven that can get really really hot you'll still have something delicious on your hands. 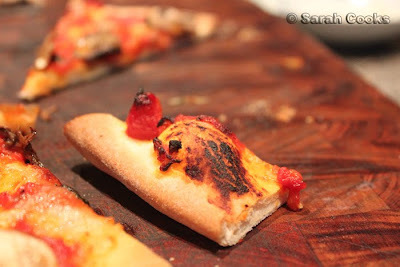 We had one of my friends over for dinner on New Years Eve, and we made it a pizza night! The dough recipe is from Giorgio Locatelli's Made in Italy, a huge tome that I've had for years, but never actually used - it's almost too big and intimidating to be picked up and read regularly. 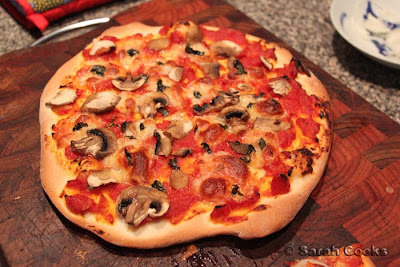 His recipe for pizza is actually for small pizette, but it's not too hard to just use the dough to make grown-up sized pizza. 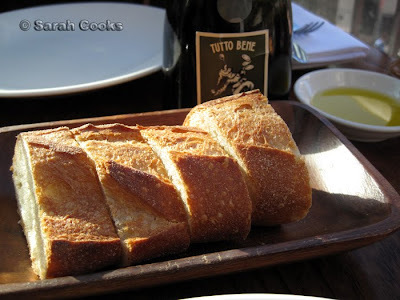 The dough is a pretty standard yeast dough, with a good lot of olive oil in it. 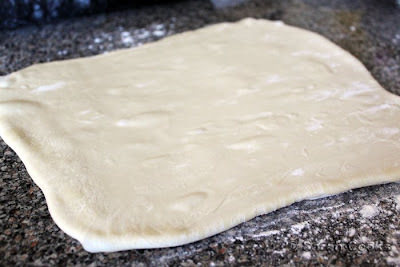 However, what is interesting is the way in which you knead the dough. It is referred to as la colomba, (dove), because you fold the dough over like a dove's wings! 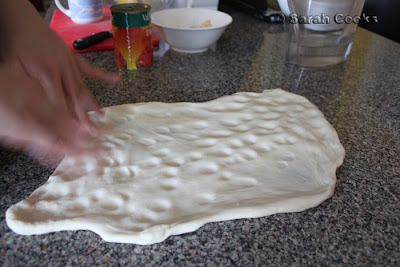 To start, you press it out with your fingers, both stretching the dough and leaving lots of indentations in it. ... and stretch it out again. You do that a couple of times (no need to rest in between), and then let it rest for 20 minutes. 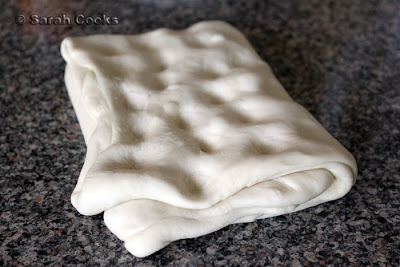 According to the recipe, the indenting and folding creates pockets of air that get trapped in the dough. I divided the dough into 3 pieces, and we all choose our own toppings for them. Onions, salami, red peppers, provolone cheese, mushrooms and tomato sauce (homemade!!!) - all of my favourites. They took about 20 minutes in a super-hot oven (240C). 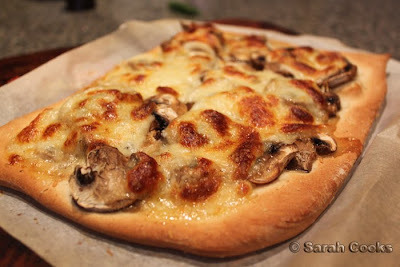 The pizza you see at the top of this post was pure mushroom - mushrooms and cheese, with a little porcini powder for extra mushroomy oomph. 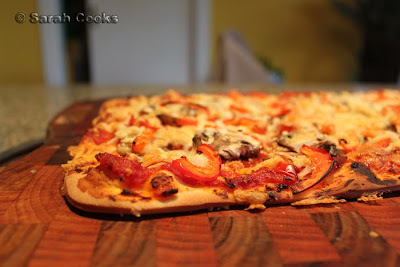 This one had mushrooms, tomato, cheese and salami! And finally, we have our pizza with the lot - a bit of everything! The dough was really yummy and super elastic... and thanks to the colomba, I got some of those funky stretchy dough bubbles that fancy pizzerias do! 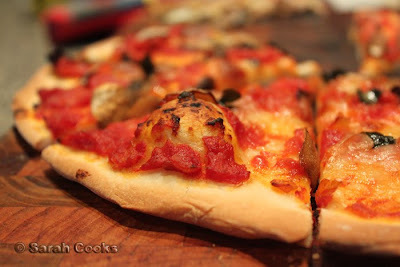 What are your favourite pizza toppings??? 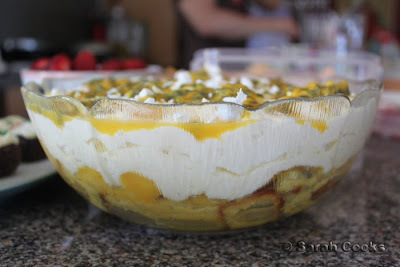 You may remember the dessert I served at our annual post-Christmas BBQ spectacular - a big, summery bowl of cake and cream and mango and passionfruit. 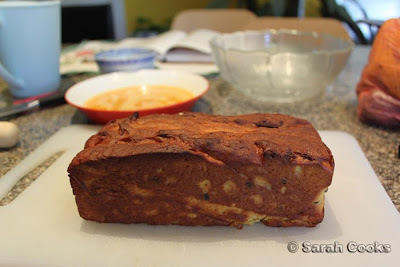 I'd been wanting to make something along those lines for ages, thanks to a loaf of passionfruit cake I had in my freezer. My local bakery occasionally makes these delicious passionfruit loaf cakes (pound or butter cake?) that I adore. Last time, we bought 2 loaves and I stashed one in the freezer for just this purpose. After much indecision, (too many recipe books! 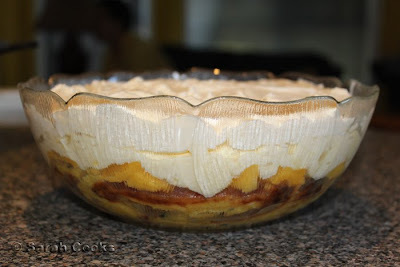 ), I adapted Nigella's recipe for passionfruit, mascarpone and meringue trifle (How to be a Domestic Goddess), and added fresh mango chunks to lighten everything up. Soaked in passionfruit juice and Grand Marnier, and wodged in the bottom of a big glass bowl. The cream - an egg-white lightened mascarpone cream, with crumbled meringues added for textural interest. Ta-dah! Once it was all layered up, I covered it with cling wrap and let it sit overnight in the fridge. And apart from a last-minute sprinkling with crushed meringue and passionfruit pulp, that was it! I enjoyed it greatly, but I suspect that's because it combined elements of my favourite fruits and desserts - pavlova, cake, cheesecake, tiramisu, passionfruit and mango! The soaking liquid has a bit of lime juice in it, which perfectly offsets the rich cream and sweet cake. If you were so inclined, you could make it in a rectangular glass dish, and arranging the layers all neatly. Or you could even make it in a springform pan, much like Nigella's tiramisu layer cake. 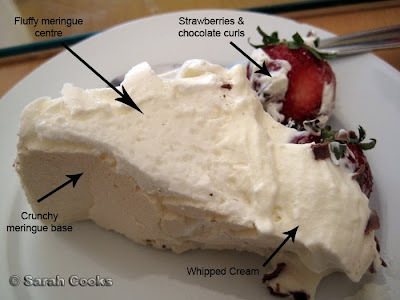 I, however, am partial to the bowl-ed trifle, not least because it lets me scoop out heaps of cream for myself without anyone noticing, hehehe. For some reason, I've found that people from the country love trifle. My friend Wes (a country boy!) apparently inhaled 3 bowls before we'd even dished it out to everyone. Yay, success!! Scoop out the pulp of 7 passionfruit into a blender. Add the juice of one lime, and pulse a few times to loosen the seeds from the pulp. Strain the liquid into a measuring jug. Pour in enough Grand Marnier to make up 300ml. Whisk the egg whites until stiff, and set aside. Beat the egg yolks with the sugar, until the mixture is thick and the sugar is dissolved. Add the juice of the other lime, and beat until smooth. 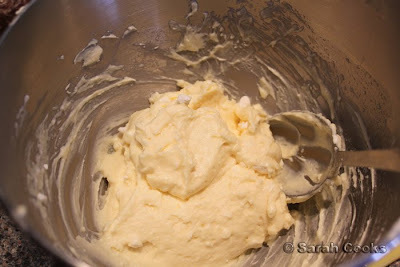 Gently fold in the mascarpone, followed by the egg whites. Roughly crumble in half of the meringues and fold in. 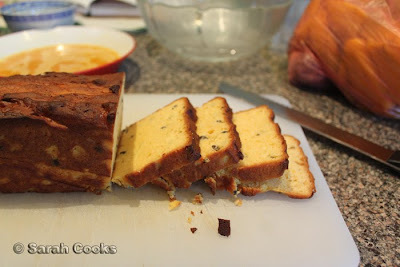 Slice the loaf cake into thick slices. 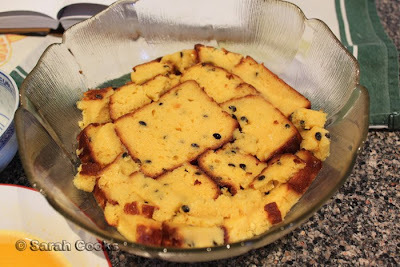 Dip the slices one at a time in the strained passionfruit mixture, and arrange in the bottom of a wide glass bowl. If you have some juice left, you can pour it over, but be careful not to let it get too soggy. Peel and cut up the mangoes into small chunks and pour over the cake, along with any mango juice that has collected on your chopping board. 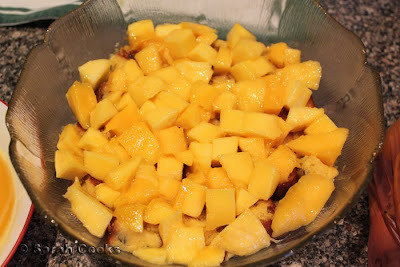 Spread the mascarpone mixture over the mangoes and cake. 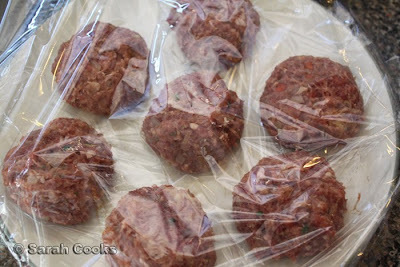 Cover the whole lot in clingwrap and refrigerate overnight. Just before serving, crumble over the remaining meringues and scoop out the pulp of the remaining passionfruit on top.